Once you've sampled preserved lemons, you'll understand why they've become such a popular and essential ingredient in Moroccan cooking. Here's a list of recipes which call for this tangy, salty, and delightful addition. If you're planning to make your own preserved lemons, be aware that they need a full month to cure before they're ready to use in cooking and salads. Chicken with preserved lemon and olives is perhaps the most popular of Moroccan dishes which use preserved lemons. Along with saffron and ginger, they provide key flavor to this and other tagines. Surprisingly easy to make, lamb with preserved lemon and olives may be prepared with lamb, beef, or ​goat meat. The recipe explains procedures for using a conventional pot or pressure cooker but also links to the preparation method when using a clay or ceramic tagine. Use fresh or preserved lemon in this traditional fish and veggie tagine. A Moroccan marinade called chermoula adds plenty of flavors, but you can make things a bit fiery by adding cayenne or chili pepper. Moroccan spices and preserved lemon transform a head of cauliflower into an exciting side dish full of flavor and color. You might also consider offering it as a light vegetarian entree. Artichoke hearts and bottoms are a favorite vegetable while in season during winter months. For this Moroccan artichoke salad, they're simmered in a tangy sauce with Moroccan spices, garlic, and preserved lemon. Olives add color and flavor. Mallow is a plentiful green in Morocco, but if it's not available in your area you can make this mallow salad with spinach or a mix of greens. This cooked salad boasts incredible flavor. Seasoned with olive oil, garlic, herbs and spices, it should be offered as a dip with wedges of Moroccan bread. Roasted pepper and tomato salad is a popular offering in homes, restaurants and roadside grills. It can be eaten as a dip or used as a sandwich filler along with meats. This version includes a little bit of minced preserved lemon rind for extra flavor. Zesty seasoning and tangy preserved lemons contrast perfectly with the natural sweetness of carrots in this beef or lamb tagine. If you like things fiery, offer a little harissa on the side. Cabbage may not make it onto your shopping list most weeks, but do give this dish of lamb with cabbage a try. It's a surprisingly delicious way to prepare this vitamin-C abundant vegetable. Although many Americans have never tried cardoons, in Morocco they're quite popular, particularly when prepared in this classic tagine recipe with preserved lemons and olives. You may find them at a farmers market if you don't grow them yourself. Cardoon stalks look like giant celery and if you are unfamiliar with them, you will need to know how to clean cardoons to prep them for cooking. 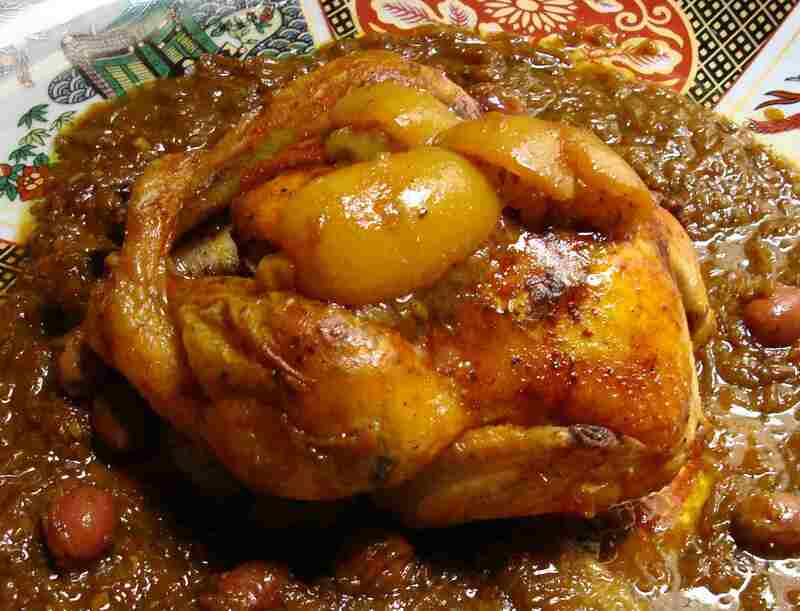 Enjoy this tangia marrakchia, often called bachelor's stew. Although you'll sometimes find tangia recipes calling for a conventional pot or pressure cooker, the traditional way to prepare this stewed meat dish is to slow-cook it in an urn-like clay pot called a tangia. If you don't own a tangia, you can use a casserole or other oven-safe dish instead. The addition of preserved lemon is optional but recommended in this chicken dish with nigella seeds. The seeds impart oregano-like flavor and have the added benefit of being very healthy for you. This delicious chicken with potatoes and olives has been a family favorite for many years. Preserved lemon is optional for those who like its tangy, lemony flavor. This tagine with carrots, potatoes, and chickpeas is another veggie-laden tagine that calls for preserved lemons and olives for extra flavor. Use lamb, beef, or goat meat. If using dried chickpeas as most Moroccans do, remember to soak them the night before. This tagine with eggplant is another tagine where preserved lemons are optional but recommended. Meat is stewed with onions, tomatoes, and partially-pared eggplant. The traditional Moroccan seasoning includes ginger, saffron, turmeric, cinnamon, and pepper. Potatoes are a common addition to this classic tagine of lamb and green beans. Beef or goat meat may, of course, be substituted for the lamb. This delicious family meal of lamb or beef with potatoes features kid-friendly potatoes stewed with lamb or beef until tender. Robustly seasoned with Moroccan spices, the sauce is given unique lemony flavor by the addition of preserved lemons. Fragrant, delicious and easy to throw together, this chicken tagine gets baked in the oven rather than being prepared stove top. For casual meals, patates frites are often served right on top!